On this page you can learn how to send SMS messages in Ozeki NG SMS Gateway. The article lists the possible methods of composing a message, and you will also find the available message types that can be sent from the SMS gateway software. All of them are demonstrated with screenshots about their compose windows that will show how to fill these forms to be able to send out messages. 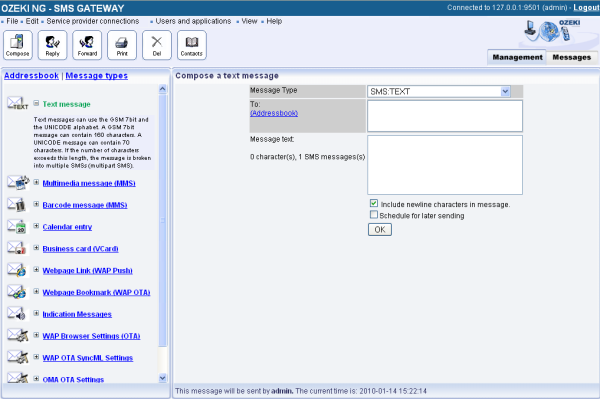 SMS sending function is also available in the "Management Console" and "Messages" view in Ozeki NG SMS Gateway. You can start this function if you click on "File menu" in the main menu and select "New message" option. In this way a "Compose a text message" window appears. In "Management Console" and "Messages" view you can also achieve a message compose window with one click if you click on "Compose" icon as it is available in both views (Figure 2). Both possibilities will reach the same "Compose a text message" window (Figure 3). Text message: Text messages can use the GSM 7bit and the UNICODE alphabet. A GSM 7bit message can contain 160 characters. A UNICODE message can contain 70 characters. 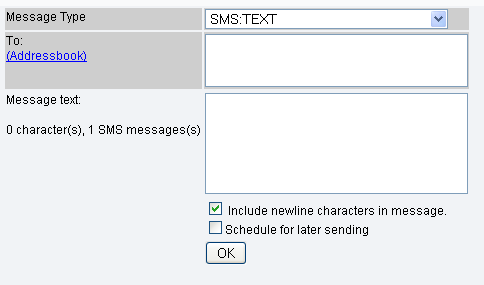 If the number of characters exceeds this length, the message is broken into multiple SMSs (multipart SMS). 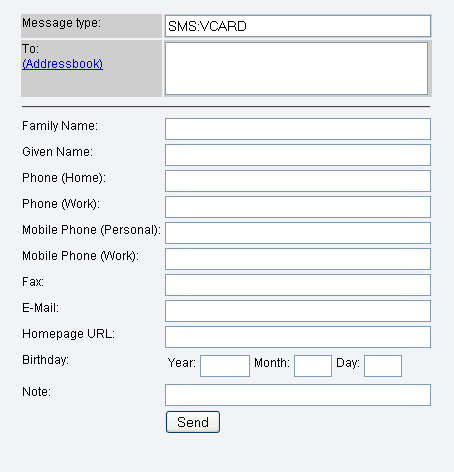 To send SMS message you need to complete this form. First provide the phone number of the recipient(s). You can use the addressbook of the software that makes selecting multiple phone numbers easier and faster. Then compose the body of the message. Under this text box you can schedule your message for later sending. If you finish, click on "OK" to send your message (Figure 4). Multimedia message (MMS): The multimedia message can be used to send picture, sound, video and text to mobile phones. To send an MMS message first enter the phone number of the recipient(s). To speed up this process you can use the addressbook of the software. Provide a subject for your message and compose the body of your message. Under the text box you can attach numbers of multimedia contents to your message. Below you can enable the delivery and read report of your message and set its priority (High, Normal, Low) and its message class (Personal, Informational, Advertisement). 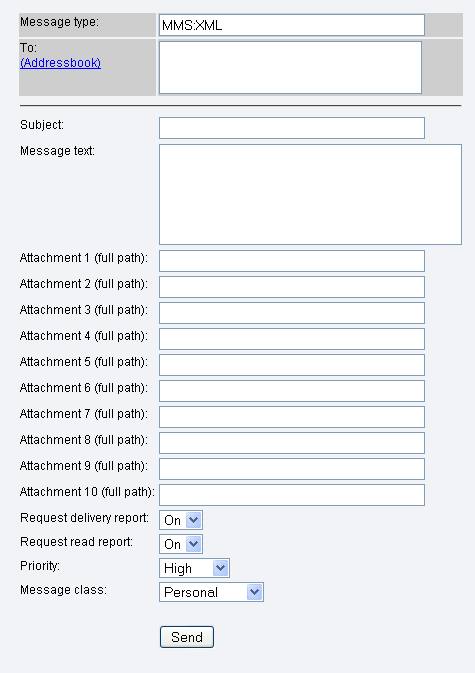 Finally click on "Send" to send your message (Figure 5). Barcode message (MMS): This barcode message can be used to send an EAN13 barcode to mobile phones. Specify the phone number of recipient(s). You can use the addressbook tool of the software to make this process faster. Then provide the EAN13 code (European/International Article Number). Finally, you can compose the text of your message but this part is optional. Click on "Send" to send the message (Figure 6). 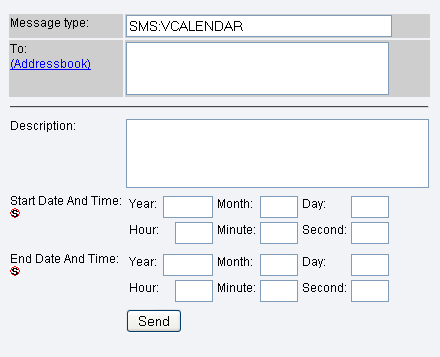 Calendar entry: This type of message can be used to send a calendar entry to a mobile phone to remind the user of an important date. First specify the phone number of the recipient(s). In case of more than one recipient you can use the Addressbook function of the software to speed up this process. Then you can enter a description on the entry. Finally, define the "Start Date and Time" and "End Date and Time" (Year, Month, Day, Hour, Minute, Second). Click on "Send" to send your entry (Figure 7). Business card: This type of message can be used to send an electronic business card to a mobile phone. It allows you to transfer information such as names and phone numbers, homepage URLs and dates of birthday to a vCard-aware mobile phone. First specify the phone number of the recipient(s). In case of more than one recipient you can use the Addressbook function of the software to speed up this process. Then you need to provide data that is essential on a business card: Family Name, Given Name, Phone (Home), Phone (Work), Mobile Phone (Personal), Mobile Phone (Work), Fax, E-Mail, Homepage URL, Birthday (Year, Month, Day). You can also write a note to your business card for the recipient. Click on "Send" to send the business card (Figure 8). Webpage Bookmark (WAP OTA): Send bookmarks of any kind, which can be used for browsing. First, you need to provide the phone number of the recipient(s). To speed up adding phone numbers one by one, you can use the Addressbook function. 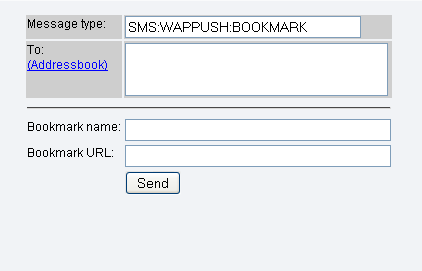 Then, define "Bookmark name" and "Bookmark URL", finally, click on "Send" to send your message (Figure 10). Then you need to enter the phone number of the recipient(s). 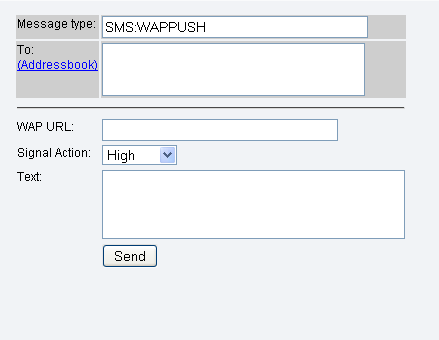 In case of more than one recipient you can use the Addressbook function of the SMS gateway to speed up this process. 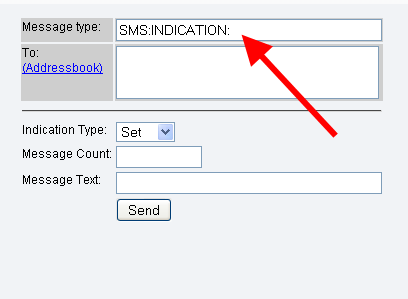 You need to define the "Indication Type" (Set, Clear), "Message Count", "Message Text" and click on "Send" to send your message (Figure 11). In "Combined Message Indication" message you can specify the indications together and you need to define the "Indication Type" and "Waiting Message(s) Count" for each types of indications. Finally, you can compose the body of your message and click on "Send" to send the message. In case of GPRS connection you need to enter the phone number of the recipient(s). You can use the Addressbook that helps speed up this process. 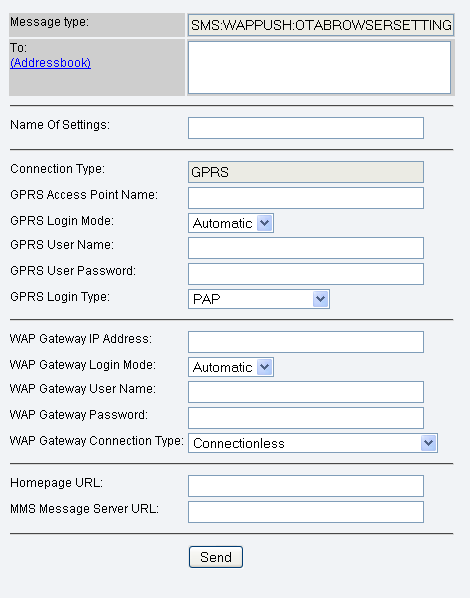 Then provide the following information in the respective lines: Name of Settings, Connection Type (GPRS), GPRS Access Point Name, GPRS Login Mode (Automatic, Manual), GPRS User Name, GPRS User Password, GPRS Login Type (PAP, CHAP, MS-CHAP), WAP Gateway IP Address, WAP Gateway Login Mode (Automatic, Manual), WAP Gateway User Name, WAP Gateway Password, WAP Gateway Connection Type (Connectionless, Connection-oriented, Connectionless (WTLS), Connections-oriented (WTLS)), Homepage URL, MMS Message Server URL. Click on "Send" to send your message. WAP OTA SyncML Settings: SyncML settings are used to provide handsets with basic settings needed to establish a sync session with a sync server. OMA OTA Settings: OMA OTA settings are used to provide handsets with basic settings. 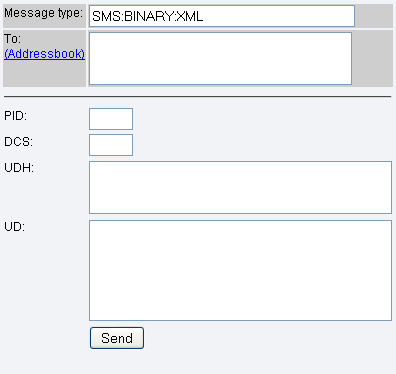 Binary XML: You can specify the binary message data in XML format.